Hello Tampa Bay! It’s Jodi with an update on what’s going on at the Straz Canter. Need an idea for Date Night or just looking for a fun, funny night out with your friends? Miss Abigail is the answer to your question. Miss Abigail’s Guide to Dating, Mating, and Marriage is a quirky play that will answer all your dating, mating and marriage questions. Miss Abigail and her assistant, Paco, will have you laughing from the very beginning to the very end, you will be blushing at some moments, and embarrassing yourself at others. This play thrives on audience interaction and Miss Abigail and Paco bring it out whether the participants want to or not. You may find yourself getting a lesson in flirting from Miss Abigail or being twirled around stage by Paco. While you are laughing and having fun, you may find yourself learning something from the romance advice of yesteryear. Miss Abigail’s is based on a book of the same name that pokes fun at the advice of yesteryear. Some of the advice is timeless while others border on ridiculous, sexist, or politically incorrect. All make for some entertaining theater. The show was quick, lasting a little less than an hour and a half, but time flies when you are having fun. Married couples will get the most enjoyment from this play but any established couple will like Miss Abigail. New couples may feel awkward during the play because it focuses on the serious romance. 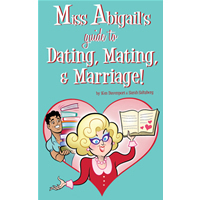 However, anyone who is or has ever been in a relationship, or just appreciates a good laugh, will enjoy Miss Abigail’s Guide to Dating, Mating and Marriage. Miss Abigail will be at the Straz Center on July 3rd and tickets start at $29.50. That&apos;s it for now, but stay tuned in for more arts and culture in Tampa Bay updates from the Tampa Bay team!